Photo taken by Sarah Kelliher (@sarahkelliher4) for Knight Sports Now. 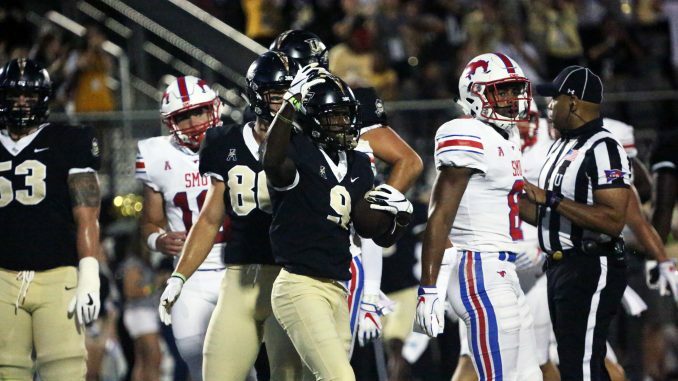 It was the first Saturday in November of 2017 that UCF survived one of its closest calls of the season, beating SMU 31-24 in Dallas. Meeting on the first Saturday in October of 2018, the No. 12 Knights (5-0, 2-0 AAC) didn’t need a late stop to take down the Mustangs (2-4, 1-1 AAC). UCF led 21-3 after one quarter and went on to win 48-20, securing its 18th straight victory in front of an announced crowd of 40,856 at Spectrum Stadium. The Mustangs took the lead on their first possession with a 31-yard field goal by Kevin Robledo, but the Knights responded quickly. Adrian Killins found the end zone from 15 yards out to give UCF a lead that it never looked back on. On the next kickoff, Rashard Causey forced a fumble that was recovered by kicker Matthew Wright. That set up a 14-yard touchdown pass from McKenzie Milton to Dredrick Snelson to extend the early lead to 14-3. One defensive stop later, Otis Anderson ran for a four-yard touchdown to put UCF up by 18. After an SMU touchdown midway through the second quarter, Wright tacked on two field goals to get the lead to 27-10 after one half of play. It was a big night for the redshirt senior, who nailed two field goals, six extra points and came up with the early fumble recovery, something he said was completely new. UCF extended its lead to 34-10 on the first drive of the third quarter, with defensive lineman Trysten Hill diving over the line to punch it in from one yard out. Milton and Anderson both added touchdowns in the fourth quarter before SMU added a late touchdown with 36 seconds left. The final score was never in doubt, as the UCF offense took what it was given all night long. With 48 points, the Knights have now scored 30-plus in 18 consecutive games. Milton finished 18-of-34 for 278 yards and two touchdowns to one interception, while Killins ran for 113 yards and a touchdown. Anderson had a big night of his own, rushing for 74 yards and two touchdowns. Snelson and Tre Nixon led the receivers with six catches and 72 and 97 yards, respectively. They both found the end zone once. The defense was just as strong, allowing only two touchdowns. One of those came on a drive that started at UCF’s nine-yard line while the other came in the final minute of the game. As a whole, SMU totaled just 320 yards while finishing six-of-19 on third downs and one-of-five on fourth. What We Learned: UCF’s offense is never satisfied. The unit put up 48 points. That marked the fourth time in five games this season that the Knights have gone over the 40-point mark, but they still feel like they missed opportunities to do more. McKenzie Milton completed just 18 of his 34 passes and there were a few runs throughout the night that were one break away from being touchdowns. Overall, the offense turned the ball over once and had to punt four times. What Went Right: The defense was absolutely dominant for the second straight week, holding SMU to just 20 total points. One Mustang touchdown came on a nine-yard drive while the other came when the game was well in hand for UCF. Randy Shannon’s group has allowed just three total touchdowns in the last two weeks. The run defense was particularly successful for UCF, as SMU ran for just 83 yards on 39 carries. That averages out to just 2.1 yards per attempt. The Knights as a whole totaled 12 tackles for loss in the victory. The effort came as no surprise to defensive tackle Trysten Hill, who said the unit’s preparation was the key. What Went Wrong: The Knights are playing at such a high level that the negatives from their victories are often found through nitpicking. For Saturday’s 28-point win, one of the small issues was that the team allowed yet another late touchdown, meaning the final score might indicate that the game was closer than it was. It isn’t a huge deal in the grand scheme of things, as UCF’s mantra is to “go 1-0 every week.” The team obviously did that in convincing fashion, but a late score brought the final score to 48-20 instead of 48-13. The Knights face an uphill battle as far as any playoff aspirations are concerned just by the nature of the conference that they are in. The AAC doesn’t get much respect from analysts and college football personalities around the nation, so UCF often needs to win by as much as possible if it wants to continue to grab more attention from AP Poll voters and decision-makers. The team had a chance to win by five scores, but it fell to four. Regardless, Josh Heupel feels that the conference is on its way to establishing itself by year’s end. Offensive Player of the Game: Adrian Killins. The junior running back has been Mr. Consistency for the backfield throughout the first five games and broke through with his fourth career 100-yard rushing game on Saturday. He ran a career-high 20 times for 113 yards and a touchdown, leading the way for a running back group that totaled 256 yards on the ground. After Killins led the way in the early going, Otis Anderson got his share of carries and had his best game of the young season. He ran six times for 74 yards and two touchdowns. Defensive Player of the Game: Trysten Hill. Titus Davis had a big night with six tackles (three for loss), a sack and a forced fumble, but Hill stole the show with two plays. He had a tackle for loss defensively and scored his first career touchdown when he got his opportunity on the offensive side of the ball. After seeing teammate Jamiyus Pittman score on offense last year, Hill was eager and happy to get his chance on Saturday. After the score, Hill was flagged for spiking the ball. He said he got carried away in the moment and that it wasn’t premeditated. The behind-the-back 360 dunk celebration after his tackle for loss was a different story. UCF returns to action next Saturday at Memphis, looking for its 19th straight win. Kickoff is set for 3:30 p.m. The game will be televised by ABC.